What would a city look like if it empowered seniors to be healthy, vibrant, and productive members of the community? That’s the question that city leaders in Long Beach, California, sought to answer with a new report analyzing gaps in resources and services for the city’s older residents. In a city of 470,000 people, one quarter of residents are over the age of 50 and nine percent are over the age of 65. Nearly 30 percent of residents age 65 or older live alone, and 14 live below the poverty line, a number that is expected to grow to 22 percent by 2025. The city’s Community Health Bureau (CHB) has been aggressive about responding to the growing need for programs and services for seniors. It created the Long Beach Healthy Aging Center, one of the first cities to designate an office entirely to senior services. Last fall, it enlisted FUSE fellow Karen Doolittle to continue to identify gaps in programming for the city’s aging population and develop more comprehensive approaches to meeting their needs. The process involved more than 60 stakeholder interviews, extensive secondary research, and in-depth statistical analysis. The results of the gap analysis were presented at a May event devoted to reimagining aging in the city of Long Beach. The analysis underscored the need for more services that go beyond clinical care, especially in-home support to assist seniors with daily chores, like picking up medicines or buying groceries. This is particularly important in the face of the growing prevalence of Alzheimer’s disease and dementia. An expansive view of senior health also takes into account the needs of Long Beach’s distinct senior populations. Gary Cucchiaro, 78, a longtime resident of Long Beach and a volunteer at the Long Beach Senior Center says he would like to see housing support included in the city’s plans to assist local seniors, who are among the most impacted by high housing and rental costs. “Every day, five or six people come in looking for housing,” said Cucciaro. Long Beach also has a large community of Cambodian refugees, some of whom may require more intensive support, such as language assistance or trauma-informed care. “You don’t know what someone has been through when they come through the door,” said Cantrell-Warren. Over the next year, the city will be looking at these various needs in further depth, developing strategies to support a more holistic view of senior health. Core to CHB’s mission is ensuring that Long Beach is as welcoming for older adults as it is for everyone else, for both big and small day-to-day experiences. For example, CHB staff members have gone on “audit walks” with seniors to observe the mobility challenges that seniors encounter while moving through the city. “We learned where there were cracks in the sidewalks and which roads seniors don’t cross because the walk time is too short.” The city is also applying universal design concepts to make sure that city spaces, such as libraries and parks, are accessible to seniors. Wherever possible, the city is working to incorporate programming for seniors into existing resources. “Instead of having a separate senior plan for mobility or parks, we want to incorporate programming for seniors into existing plans.” As just one example, the city is in the process of revising its economic development plan to include the policy needs of seniors, who launch new businesses at nearly twice the rate of people in their twenties. “It’s about taking all of these available resources and services and seeing where we can add in a layer of intergenerational equity,” said Doolittle. This kind of intergenerational transfer of knowledge can have a powerful, positive impact on the community, while also helping to address one of the most significant threats to the wellbeing of seniors, especially those who live alone. “Intergenerational equity is a way of getting seniors out of isolation,” said Doolittle. 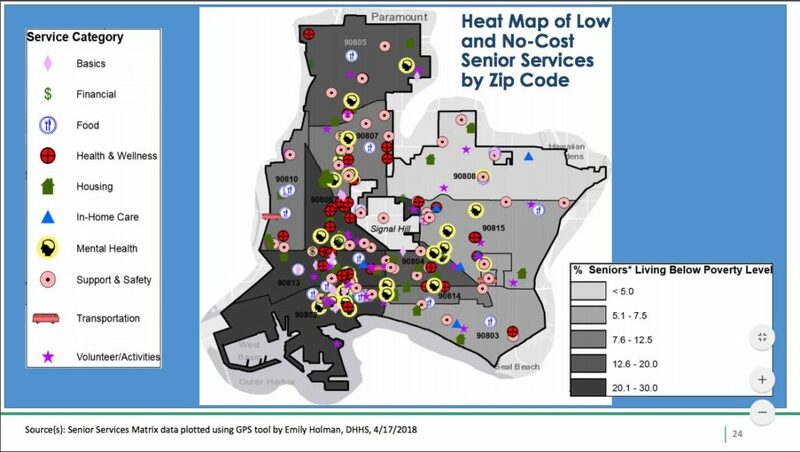 To better understand the landscape of available resources, Doolittle produced a series of heat maps showing where service providers were located throughout the city. She then cross-referenced this data with the senior population by zip code and income level to identify gaps. “The next step is to figure out how to better coordinate and integrate services so we can reduce costs and get even better outcomes,” said Doolittle. One of the biggest challenges is closing the loop on referrals, and making sure that seniors are actually receiving the services they need. “How do we put a mesh around the system so we’re making sure that the client we referred is making it to that referral?” Cantrell-Warren said. Picture a city that empowers seniors to be healthy, vibrant, and productive members of the community. If CHB is successful in implementing its proposed reforms, it could look a lot like Long Beach. Wow! I love empowering senior citizens, they have a wealth of knowledge and inspiration. Excellent business and strategy for implementation for All communities. The City of Long Beach, and the Long Beach LGBTQ+ Center are both ageist. The main senior center on 4th street does not acknowledge in any way the LGBTQ+ seniors during Pride month. There is a large amount of brainstorming going around however, nothing has been put into place. What little actions have been put into place they have no distinct measure of accountability. The scope and vision of what is needed for all Seniors is lacking. Services such as affordable housing, social and nutritional programs need to be completely revamped. They are being operated on outdated models. The social and nutritional models need to be updated for the 22nd Century. The face of Seniors is changing now. The City of Long Beach is not ready for this change and will not be as long as its “leaders” are ageist.